A popular pet with striking shell colorings, red-footed turtles are long-lived and relatively easy to care for. They're sort of the stereotypical-looking tortoise, with a large shell that has markings on its top portions. If you're thinking of getting a red-footed tortoise, be advised that although they're not high-maintenance pets, they do live much longer than a pet dog or cat would. Just be sure you're prepared to grow old along with your red-footed tortoise before making a commitment. Unlike some other breeds of tortoise, the red-footed are fairly active during the day. In the wild, they spend most of their time digging and foraging. If they've eaten a large meal, however, they can spend as long as a week resting. Wild red-footed tortoises, which are found mainly in Central and South America, are prolific burrowers. They burrow to seek shelter, when the temperature becomes too hot, and to hide from predators. They feel most secure in a hiding spot where they fit tightly, such as a tree trunk, sometimes wedging several tortoises in at once. Also in the wild, red-footed tortoises often display social behavior, sharing food and gathering in small groups. They're not overly territorial of nesting or feeding sites unless two males are competing over a female. In captivity, these cute tortoises will display signs of shyness, hiding or burrowing when they feel stressed. In general, they prefer not to be handled (and as a rule, you should prevent small children from handling turtles and tortoises, due to the possibility of salmonella infection). In the wild, red-footed tortoises are omnivores and eat a wider range of foods than many other tortoises do. It is very important to not overfeed these tortoises with animal protein though. One very small serving of moistened low-fat cat food or lean meat (roughly one ounce for a full grown red-footed tortoise) every other week is plenty of animal protein if you feel the need to offer it to your tortoise. A variety of fresh, dark, leafy greens such as dandelion greens, endive, mustard greens, and escarole (but be sure to monitor the calcium to phosphorous ratios of these greens). Other vegetables and fruits should also be part of this tortoise's diet; red-footed tortoises tolerate fruit better than many other species. A calcium and vitamin D3 supplement should be used a few times a week. This species is native to tropical areas and prefers a humid climate. A sturdy, escape-proof enclosure can be provided outdoors and a sprinkler or mister can be used to increase the humidity if needed. A muddy wallow will be used by the tortoise as will a pan of clean water. 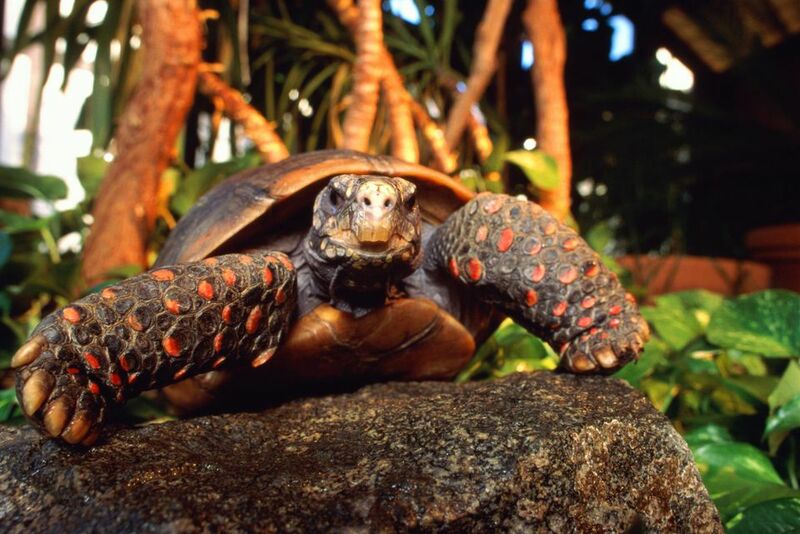 Ideally, a red-footed tortoise will have an area densely planted with vegetation for a cool retreat. A doghouse-type shelter can be used for adult red-footed tortoises; it should be heated if nighttime temperatures drop below 65 or 70 degrees Fahrenheit. Daytime temperatures can safely reach up to 95 degrees. The walls of the enclosure should be about 16 inches high and also go a few inches below the ground to prevent your red-footed tortoise from digging and escaping. If you choose to house your red-footed tortoise inside then you'll need a large enclosure (roughly one that is four feet by six feet or larger). Cypress bark as a substrate helps retain humidity although paper will also work and is easy to clean. A UVA/UVB light is necessary for an indoor enclosure since your tortoise won't be exposed to unfiltered sunlight inside. The enclosure should also be heated using special heat bulbs. A basking spot of 95 degrees should be provided with the daytime thermal gradient getting no lower than 80 degrees. If the tortoise's enclosure drops below 70 degrees at night, it could put the animal at risk for developing a respiratory infection or hypothermia. A pan of water should be provided at all times for your red-footed tortoise to walk into and the enclosure should be kept humid. A hide should be placed at the cool end of the enclosure to allow your tortoise a place to retreat. Red-footed tortoises do not hibernate but they may start to slow down during the colder months, even if they are housed indoors. Shell rot, an infectious disease caused by bacteria or fungus, shows as flaky patches on the animal's shell. It's a fairly common but problematic health condition that can lead to more serious infections, and usually requires antibiotics. Vitamin A deficiency can cause swollen eyes and other infections, and unsanitary conditions can lead to ear infections. Both of these ailments will clear up with antibiotic treatment. Red-footed tortoises also are prone to parasitic infections, which may only be detected during an examination by a veterinarian. These tortoises have seen a significant population decline in the wild, due to loss of their natural habitat and over-hunting. If you want to have a red-footed tortoise as a pet, you should get a captive-bred one from a reputable breeder. Look for signs of shell rot (flaking or crustiness on the shell) which may indicate a tortoise with health problems. Healthy turtles aren't super affectionate or outgoing, but one that seems lethargic or non-responsive also may be ill. Otherwise, check out these other tortoise profiles.